While ADP has a cheaper sticker price, they offer fewer discounts than Paychex. In addition, ADP charges a small setup fee to begin using the software. When it comes to small businesses, payroll companies are one of the best ways to easily complete payroll. They know the different regulations in each state, so payroll businesses make it simple to expand into new areas. Two of the largest payroll companies are Paycheck and ADP. They offer outsourced payroll services as well as DIY payroll software. The company that you ultimately choose will depend on the types of services, fees and features that you need. Do You Want Payroll Software or Payroll Services? Both companies offer payroll and HR services. In essence, they work as an an outsourced HR department. Through a single adviser, you can get all of your onboarding, payroll and other benefits run by the company. If you want to, you can also download the software to do the payroll on your own. Small businesses often turn to outsourced payroll because it helps to lower HR costs. While HR services can cost 3 to percent of your payroll, payroll software typically costs just $50 to $150 per month. With the payroll software, all of the normal payroll hassles are handled for you. If you hire a new employee, the reports are filed electronically. Afterward, the payroll taxes are automatically calculated and sent in for you. Due to the exceptional benefits and cost savings of payroll services, many small businesses choose to outsource their HR department to these companies. Started in 1949, ADP quickly grew to become one of the largest outsourcing services in the county. Back then, a young Henry Taub was visiting a company where the HR employee was out sick. The workers were not paid, and Taub saw an opportunity. He originally set up shop above an ice cream parlor in New Jersey. During the early decades, the work was done by hand using calculators and an Underwood bookkeeping machine. By 1950, ADP had doubled in size. While the idea of outsourcing payroll services was new, it was quickly starting to catch on. By 1961, the growing company went public with a total of 125 employees and 300 clients. By 1985, ADP reached the $1 billion mark in annual revenue. Altogether, the company handled about 20 percent of the paychecks for workers in the United States. Since then, ADP has remained a leader in payroll services and software programs. Located in Penfield, New York, Paychex was first started in 1971. Tom Golisano originally founded the company with just $3,000. By 1979, the company expanded to include 18 franchises that were later consolidated into just one company. Like ADP, Paychex went public as the company grew. In 1983, it began trading on the NASDAQ Stock Market. Over the years, Paychex has added new services, software programs and features. By 2013, the business was pulling in $2.3 billion in revenue. Today, it has 580,000 payroll clients and 100 offices located throughout the world. In general, most of the software costs and features are fairly similar. Paychex and ADP both offer services like tax management and direct deposit. The main difference for small businesses is the price. While Paychex charges a higher price, they often have discounts available that make their services the lowest price on the marketplace. Check for these discounts in advance, and you could end up saving $1,000 to $2,000 a year. Unlike ADP, Paychex does not charge any setup fees. Once you are running the program, you can get help with workplace posters and tax management. Do they offer 1099 and W-2 support? Yes, but it costs an extra $$122.50 per year for 10 employees. Do they offer direct deposit? Yes. Can they manage your taxes? Yes. Do they offer workplace compliance posters? Yes. Customer support options: Phone and e-mail support are available at all times. Can they send your employees a check? Yes. Do they offer 1099 and W-2 support? Yes, but it costs an extra $101 per year for 10 employees. Comparing prices between the two companies can be difficult since they both regularly offer discounts. These discounts are normally for a set promotional period, so we will just consider the prices that are actually listed by the companies. ADP and Paychex both charge per pay period, so you can expect to pay for the service every time you pay your employees. If you have 10 employees on a bi-weekly payroll, you will end up paying $106.85 with ADP. This averages out to $151.72 per month. For processing W-2s and 1099s, you will pay an additional charge. ADP charges $45 for processing the taxes of employees as well as an additional $5.60 per employee. Overall, this works out to $105.30 for 10 employee each year. With Paychex, you are charged a slightly higher amount to process your 1099s and W-2s for each employee. On average, you can expect to pay a $60 base cost plus $6.25 per employee. For 10 employees, this works out to $122.50. Both of the companies offer similar features for small businesses. At the most basic level, they allow you to run your payroll online. The software automatically submits reports from new hires and allows employees to be paid through direct deposit. Payroll reports can be printed out, and employees can login to manage their information. FICA, SUTA and FUTA taxes are always calculated automatically. Likewise, the two companies let you setup workers compensation insurance. Both payroll companies allow you to set up benefits through the software program. Due to this, you can set up health insurance or a retirement fund for your employees. Afterward, the software program will manage the rest of the details. In addition to the previous options, ADP and Paychex also offer check printing and poster compliance. If you like to send checks instead of using direct deposit, both payroll companies will help you to print, sign and mail the checks. They will also send you the workplace posters that you need to display to remain compliant with current labor laws. Paychex is ideal for any size of business. It works best if you are looking for an online solution for your payroll. ADP is designed for accounting professionals who need to process payroll. It is ideal for most businesses. A steep learning curve for individuals unfamiliar with using ADP. According to their websites, ADP and Paychex both have around-the-clock customer support. As the larger business, it seems like ADP may have more problems with customer support. Reviews on sites like Yelp indicate that many users had to wait for a long time on the phone when they had an issue. ADP is not alone in having customer support issues. Like ADP, Paychex has garnered some negative reviews on websites like Yelp and G2Crowd. For Paychex, the main complaint is that the company is disorganized. Some users have also mentioned that the interface seems to be old and slower than similar interfaces. While Paychex has better reporting and monitoring, ADP still does fairly well. On the home screen, ADP offers a to-do list of items that you need to address. The interface includes a tax and compliance services function that lets you handle tax filings, unemployment claims, tax credits, W-2 management, employment taxes, tax payments and wage garnishments. Each report in the ADP system is easily accessible from one of the four different categories. All of the reports are created in real time, so users can easily access the latest reports. ADP lets you filter the reports according to the employee or export it to Excel. Clients are also simple to manage through the program. In comparison, Paychex does an overwhelming good job of handling reports and monitoring. Current and future payroll cycles are automatically displayed within the user dashboard. Meanwhile, Paychex handles all of the form compliance and tax calculations. Before finalizing the payroll report, users can access the cash needs report and the payroll journal. As an added benefit, Paychex collects all of the funds needed for federal, state and local taxes. It includes a custom reporting tool that lets you change the layout and criteria included in the report. Every report can be exported from the software program as an Excel or a PDF file. Reports can also be e-mailed or printed out from the interface. Both businesses offer exceptional self-service features. With Paychex, you can choose the level of access that each client, user or an employer has to the program. Employees can access the program through a custom employee dashboard to update their 401K information, user name, tax data and passwords. Employees can easily look at their current and past check stubs online or from their mobile device. ADP offers a similar service for their clients. Your firm controls the access level for each employee or user. Employees can be given three levels of access. Depending on the employee, you can allow them to have view only or employee time entry. You can also set up employees to have access to changing records. All clients can easily access tax forms and brand them with the firm’s logo or header. ADP offers an online platform for managing payroll that can be used on mobile devices, desktops and laptops. From the home screen, users can select taxes, employees, reports and companies from the drop-down menu. Meanwhile, icons on the left side of the screen show different payroll functions. The user interface at ADP is fairly easy to use, and it allows multiple users to be on the system at any moment in time. While multiple users can be viewing the system, only one user can edit information at any point in time. Users can preview payroll liability, cash requirements and other information before they run payroll. A to-do list also shows the most urgent matters that need to be addressed. With Paychex, payroll and similar services are integrated into a single system. The system offers an administrator and an employee dashboard. Once logged on, users can access different tabs to perform tasks. The system dashboard also shows all of the users who are currently logged in to the program. Each user dashboard can be further customized according to the unique needs of the user. The Paychex platform is compatible with Blackberry, iOS and Android devices. Users can control the system access permissions and generate payroll reports. Once the system is set up, the firm can set specific access levels for each employee. Payroll processing can be automatically run, or you can enter the payroll totals into the interface. Paychex is capable of handling taxes and payrolls in all 50 states, so it is ideal for companies that want to expand into new geographic regions. 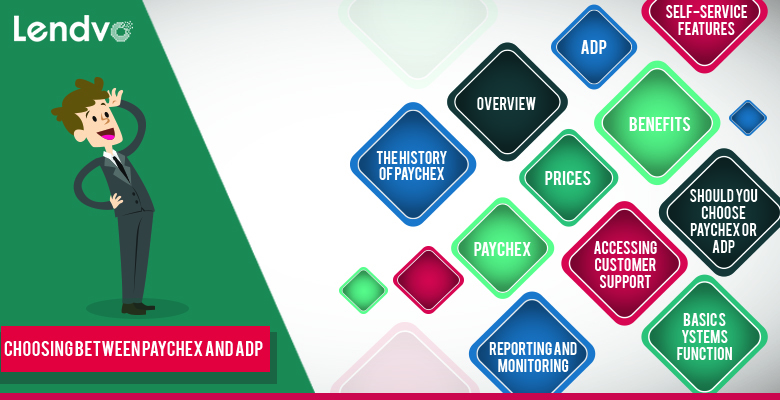 Should You Choose Paychex or ADP? While ADP has a longer history in the industry, its interface can sometimes be outdated. It does have a lower price tag, so ADP is an ideal choice for companies that want to save money. Since Paychex offers regular discounts, it is possible to get a better deal with Paychex. Both business offer similar services, accessibility and customer support. Due to this, they are ideally suited for any size of business.